North Carolina is home to the longest continuous barbecue tradition on the North American mainland. 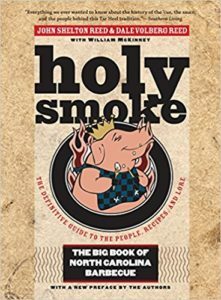 Now available for the first time in paperback, Holy Smoke is a passionate exploration of the lore, recipes, traditions, and people who have helped shape North Carolina’s signature slow-food dish. The authors trace the origins of North Carolina ‘cue and the emergence of the heated rivalry between Eastern and Piedmont styles. They provide detailed instructions for cooking barbecue at home, along with recipes for the traditional array of side dishes that should accompany it. The final section of the book presents some of the people who cook barbecue for a living, recording firsthand what experts say about the past and future of North Carolina barbecue. Filled with historic and contemporary photographs showing centuries of North Carolina’s “barbeculture,” as the authors call it, Holy Smoke is one of a kind, offering a comprehensive exploration of the Tar Heel barbecue tradition.